The area around Spring, Main Street and 9th Street continues to grow as a lunch (and sometimes breakfast) food court feeding the Fashion District and local loft dwellers. Tuesday brought the opening of WoodSpoon, a breakfast and lunch cafe serving Brazillian dishes like a Brazillian Chicken Pot Pie "hearts of palm, potato, olives, roasted corn" and a Pork Burger with "roasted cabbage, onions on a toasted country roll." Wood Spoon owners Natalia Preira and Darius Danta have added sometime different to the area. Not many places where you can get Brazillian Grilled Beef or a Brazillian omelette downtown. I walked by earlier that opening day and the cafe had a good little crowd at lunch. And the cafe itself is not overdone and keeps the integrity of the space. 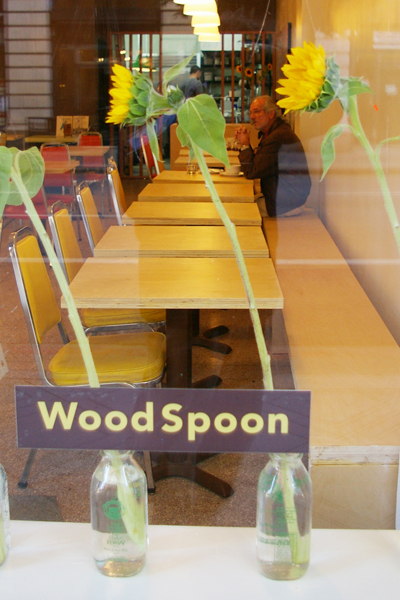 Photo: The end of day one for Wood Spoon. David Markland at BloggingLA linked our journey down Santa Claus Lane and reminded us of the best Christmas song ever. 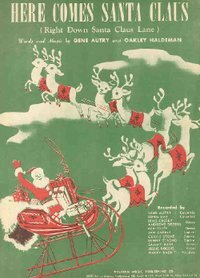 The version of "Here Comes Santa Claus" (Autry-Haldeman 1947) that was covered by the King of Kings, Elvis Presley in 1957. In making a list and checking it twice, I placed Darlene Love's "Christmas (Baby, Please Come Home)" first because she has re-recorded it several times and nails it each year on David Letterman's Christmas show. And just to note, singing cowboy Gene Autry not only wrote "Santa Claus is Coming to Town", he also penned "Rudolph, the Red-Nosed Reindeer" (1949) and "Frosty the Snow Man" (1950). Elvis, along with other rockers of the 50s and 60s, didn't shy away from Christmas music but it all hit a dry spell when the 70s rolled in. Only rock demigods secure on the throne pulled a song from the stocking until The Waitresses broke some ground with the original song "Christmas Wrapping" in 1981 that got air play on Los Angeles radio. It was joined two years later with The Pretenders recording of 2000 Miles in 1983. 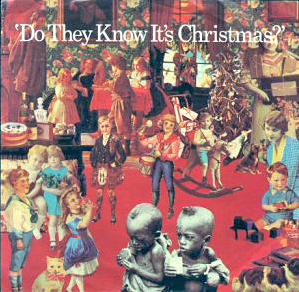 Bruce Springsteen's cover of "Santa Claus is Coming to Town" (Coots-Gillespie 1934) was recorded live in 1975 but only distributed to radio stations until a 1981 release on a children's album and then again in 1985 for the B-side of "My Hometown". 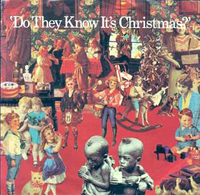 The limited Holiday playlist changed with the release of the 1984 release of "Do They Know It's Christmas" by Bob Geldof's Band Aid, that began a wave of charity-minded Christmas collectives like "A Very Special Christmas" recorded in 1987 by various artists to benefit The Special Olympics. Ever since then, there's been a sleigh-load of Holiday music just to celebrate the season. And it keeps coming. This year "You're A Mean One, Mr. Grinch" gets a Rat-Pack treatment by Aimee Mann and "Happy Xmas (War is Over)" now has a haunting version by Sarah McLachlan. Our Mascot: The Arts District has a recurring character known as "violent guy" who is "aggressive and verbally abusive." According to our LAPD rep, Kristian Werner, he was arrested again at 842 Traction Saturday, November 26 at noon. Werner is calling for any info from residents who have concerns or experiences. Knowing some of the temperments around here, he must REALLY be over the top. Or as one email asked: Which violent guy are we talking about.? Werner also invites Arts District residents to Art Share (located at the corner of Hewitt and 4th place) Thursday November 30, 7PM for the monthly neighborhood watch and community get together. Topic of discussion will by creation of an Photographic Art project detailing the problem of styrofoam trash that is omnipresent in the neighborhood and it's effects on the LA River. If you know any photographers, writters, ecologists out there who would be interested in this project, please invit them to meet with us this Thursday. 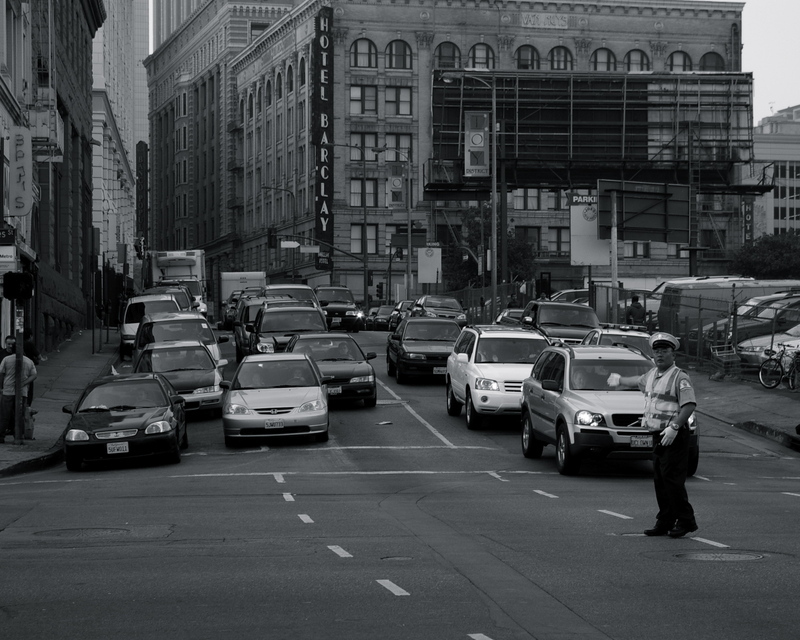 I was particularly concerned about a recent editorial in this paper criticizing the lending of portions of the 105 Freeway and roads surrounding LAX to "Live Free or Die Hard," a high-profile, high-budget production filming in L.A. The editorial included the regrettable money line: "This is one scene we wouldn't have minded being shot in Canada." Although some people may wish this shoot had been done elsewhere — and although our city may scarcely notice the effect of losing a single production — we will find ourselves standing on the curb, helplessly watching moving vans bound for Vancouver and New York City, if we allow this sentiment to direct city policy. Let's send the message that we treasure our city's creative community. It's what makes Los Angeles unique. You can be sure that I will remain committed to retaining this iconic industry, vital to a vibrant Los Angeles economy and to our identity as a city. Everyone in this town knows that it is rare for a sequel to live up to a successful predecessor. And one year after Notre Dame and Southern California played a back-and-forth epic in South Bend, the rematch ended up more like “Caddyshack II. USC's bid for a title may come from plays that displayed grace and power, but it was 245-pounder Brian Cushing picking up the ball on an offside kick and sprinting past Notre Dame for a touchdown that "left no doubt". Call it the Cush Push. While chasing photos on Main Street and Broadway with someone who wanted practice street photography for the first time, we paused by the Arcade Theater. "Sometimes you let the shot come to you" I said. 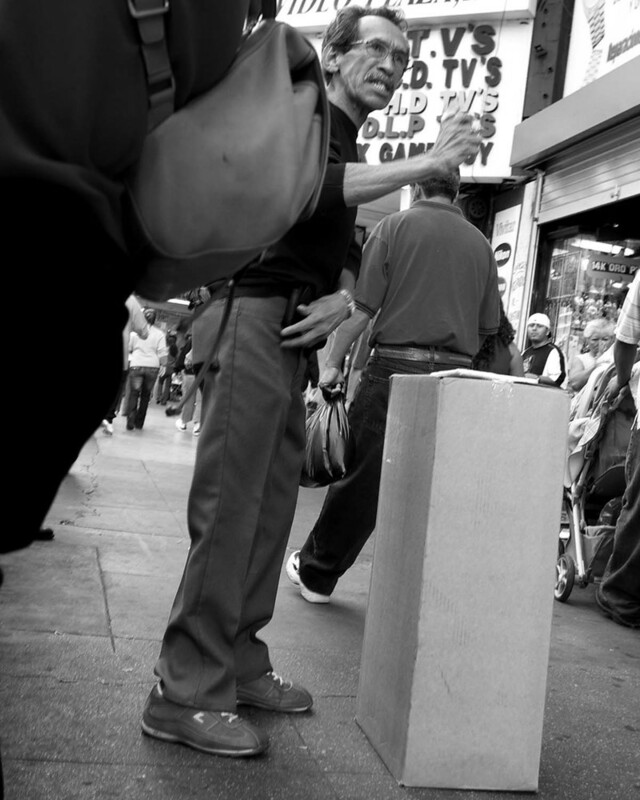 A few minutes later, a wiry man skittered a few feet away and unfolded his cardboard box into a table. Just as quickly, he deftly pulled out of his pocket three blue plastic bottle caps and a small ball. It was a shell game. The other photographer moved in to snap a photo and the man waved her away and turned his back to her. The distraction gave me a chance to shoot several frames before I suggesting we move on to the next street. Capturing a photo in public space is a game of chance and my distractive shill helped me get this shot. Pictured: Man prepares a "shell" game on Broadway south of 5th. Would you like a douglas fir with your carne asada? 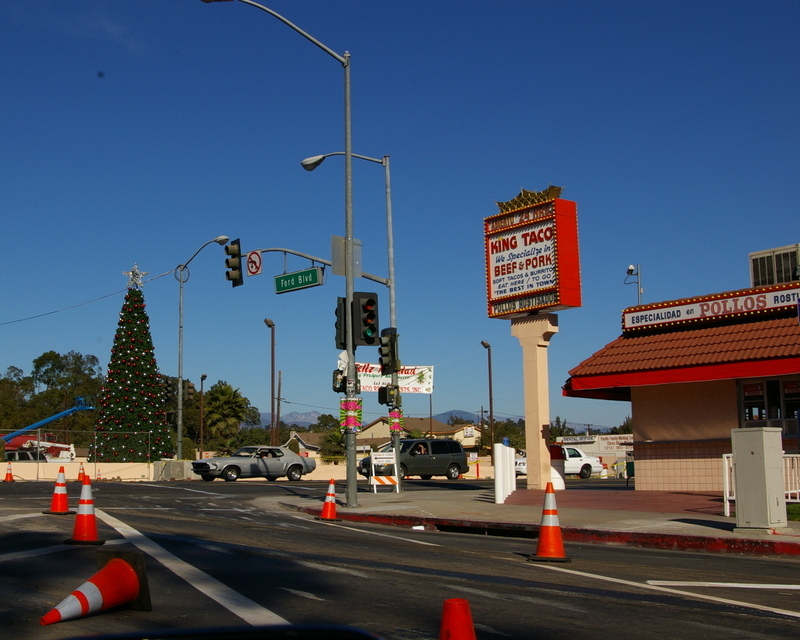 A christmas tree towers over East 3rd Street and Ford Avenue across the street from King Taco in the restaurant's tree farm. Via a link, we discovered Kevin Allman's blog. Allman is a former Los Angeles based writer who was living in New Orleans for a number of years until Katrina forced him to relocate. Now in Portland Oregon, he's a journalist/author who was a Edgar Award Nominee Best First Novel Mystery Writers of America in 1995 for his book "Tight Shot." Now his writing appears in some pretty big papers. Via ink, John Flaherty, director of campus ministry at Loyola Marymount University, was music director for the 100-strong Southern California Congress Choir who performed at Hyundai Pavilion November 3. The ceremony was held to honor the five U.S. Forest Service firefighters lost in the line of duty. Flaherty has been active in events around Los Angeles, including organizing musicians for the inauguration of Los Angeles Mayor Antonio Villaraigosa. It's a good Thanksgiving Weekend when you find out what two high school era friends have been doing. And all three of us were practicing what became our respective professsions. Hey,where do I pick up the bootleg DVDs? 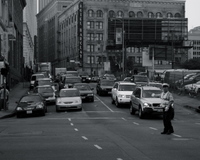 2006 Black Friday traffic at Los Angeles and Fourth Street . 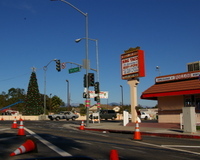 The recently trained army of LADot traffic cops were in major intersections around Downtown the day after Thanksgiving.